DAVAO CITY, 12 January 2018. Mention Surigao del Sur and what comes to your mind? Nothing except that it is located at the eastern coast of Mindanao and faces the Philippine Sea. To think of, the province has two of the most unique tourist destinations in the country: the Tinuy-an Falls in barangay Burboanan of Bislig City and the Enchanted River which shapes the boundary of barangays Talisay and Cambatong in Hinatuan. Enchanted River is as mysterious as its name itself. Like the Wakulla Springs in Tallahassee, Florida (which I had visited a couple of years ago), no one knows where the water comes from. Is it a spring? Did parts of the water come from the sea? Six hundred meters away is the coastline of Hinatuan Bay, which faces the Pacific Ocean. The river looks like a photograph that has been photoshopped; it reminds you of the movie Blue Lagoon. The waters are so crystal clear that you can see even the deepest part. If you don’t know much about swimming, try to swim in the area where there the shade of color is from blue to green; once it is darker blue, it means it is deep already. 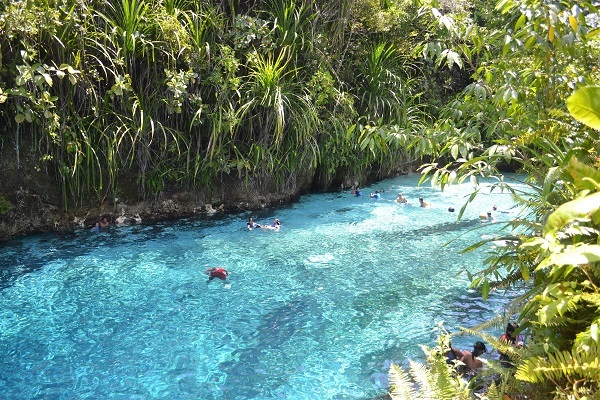 The Enchanted River at Surigao Del Sur is crystal clear, perfect for swimming. But what is baffling is that the waters look so shallow but no one really knows how deep the river is. There were some stories circulated that a foreigner tried to plunge into the visible riverbed and finds it unfathomable. 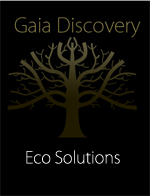 Another enigma about the river: those different varieties of fishes in various colours. Again, no one knows where they come from and where they go. Are they fairies disguised as marine creatures? Tinuy-an Falls is touted to be the widest waterfalls in the country. Its critically acclaimed majestic and unique natural formation landed in some pages of international travel magazines. What makes Tinuy-an Falls exceptional is that the 95-meter wide waterfall plunges 55 meters (180 feet) high from the top of the three tiered cascading waters that looks like a huge white theatrical curtain. Tinuy-an Falls of Surigao Del Sur at 95m wide and 55m height is claimed to be the biggest waterfall in the Philippines. “Tinuy-an Falls has been called the Niagara Falls of the Philippines,” says Redgy Panilan, a government employee. Niagara Falls is the collective name for three waterfalls that straddle the international border between Canada and the United State. The combined falls form the highest flow rate of any waterfall in the world, with a vertical drop of more than 165 feet. Just around 600m away from Hinatuan Bay lies the clear Enchanted River. There is a bamboo raft on the side of the pool which can be used if you wish to go near the falls. Just bear in mind that you should dare to do it if you are one of those who seek adrenalin rush against the monstrous power of the white cascading water. There is a smaller waterfalls located near the entrance. From there, the water goes to the river.